4- 7/16 x 1"x 3' traditional poplar Sawtooth supports and 2- 7/16 x 1" x3' of poplar cleat material. 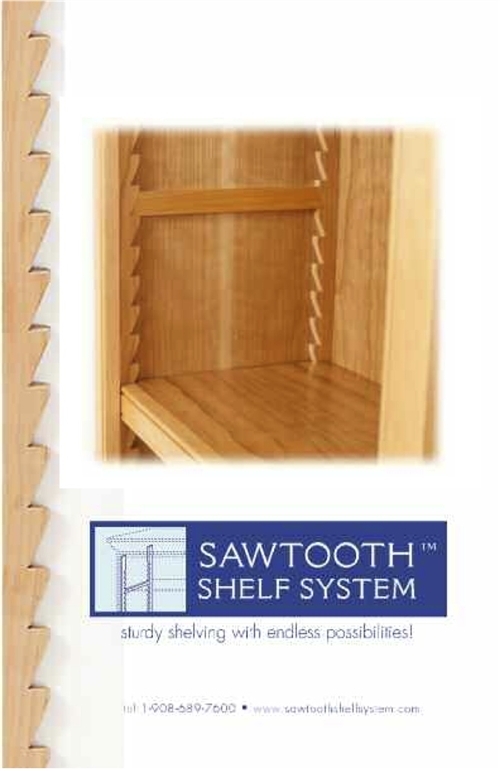 Traditional style has a flat section on top and bottom of the Sawtooth support. 4- 7/16 x 1"x 3' traditional red oak Sawtooth supports and 2- 7/16 x 1" x3' of red oak cleat material. 4- 7/16 x 1"x 3' traditional maple Sawtooth supports and 2- 7/16 x 1" x3' of maple cleat material. 4- 7/16 x 1"x 3' traditional white oak Sawtooth supports and 2- 7/16 x 1" x3' of white oak cleat material. 4- 7/16 x 1"x 4' traditional poplar Sawtooth supports and 2- 7/16 x 1" x4' of poplar cleat material. Copyright © Sawtooth Shelf System. All Rights Reserved.